Outback Jacks in Ballybane, Galway, has opened a new inflatable family tent and awning showroom. Located on the outskirts of Galway city, just 45 minutes from Athlone, with free onsite parking, Outback Jacks are Vango’s prestige dealer and supply inflatable family tents, inflatable campervan and caravan awnings. Not heard of inflatable AirBeam tents before? You will be amazed by how simple they are to pitch. One person can inflate an AirBeam tent or awning within minutes. 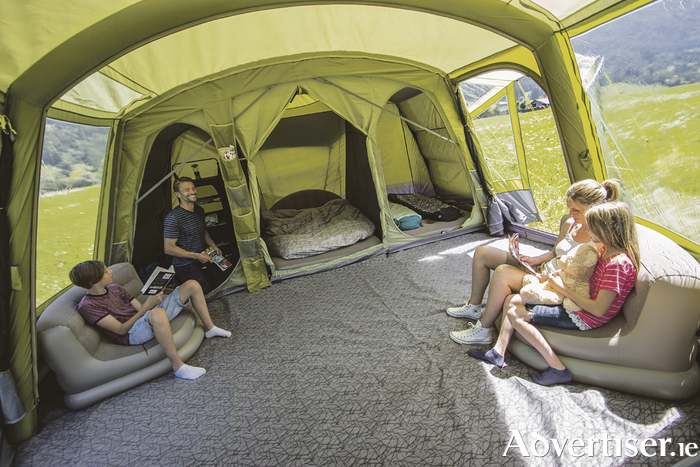 Camping solo with the kids or simply want to get your holiday off on the right foot, an AirBeam tent will make pitching and dismantling a breeze. Call into the store for a demo or to try for yourself. Airbeam tents are more resilient to winds and less susceptible to damage than poled tents. All Vango tents have a two year warranty. New for 2017 is Outback Jacks’ hassle-free inflatable gazebo’s. They are super strong, with no poles, full stand up height, six mesh panels on all sides, and three doors providing a large outdoor space in the five minutes it takes to set them up. Outback Jacks also stock a full range of sleeping bags, cookers, stoves, and accessories. Call into the store today and avail of the Vango family camping opening season offer. Get a waterproof Vango five-person poled tent with sewn-in groundsheet, carpet, two bedrooms, a front porch, and a two-year warranty all for just €379. Deposits are taken and weekly payments are also accepted. Get outdoors this summer and enjoy what camping has to offer you and your family. Outback Jacks - your home for family camping gear and outdoor wear.